Time to put down your Pokédex – there’s a new mobile game in town. Rather than aspiring to becoming the very best Pokémon trainer than no one ever was, now you can follow in the footsteps of Pablo Escobar and become a (virtual) drug lord! Yay! 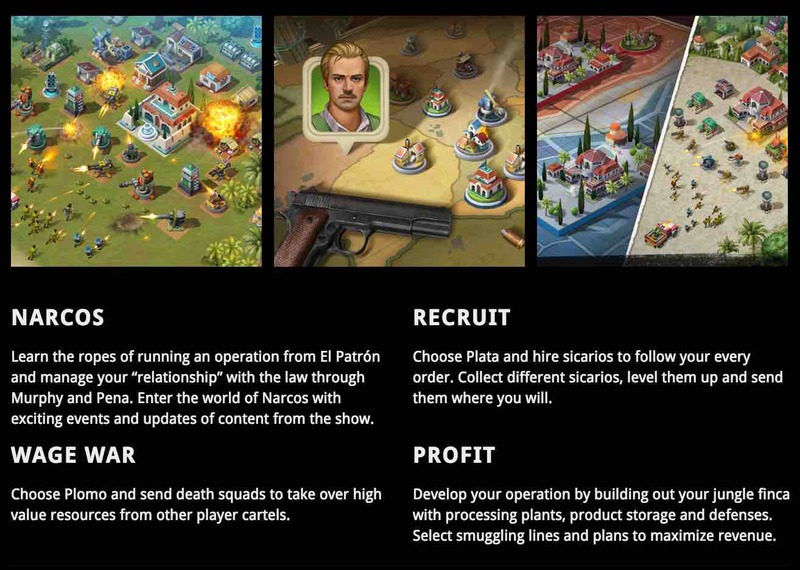 Entitled Narcos: Cartel Wars, the new free to play mobile output from FTX Games allows players to build the narcotics organisation of their dreams, which of course involves garnering the respect (or fear) of their peers, laundering money through untraceable transactions, and going to war for territory and profit. “Step into the dangerous and thrilling role of cartel kingpin in the official game of the hit television show NARCOS”, reads the game’s official synopsis. “Decide between leading through raw power or gathering respect through loyalty. Sometimes bad people do good things… In the end you must decide, will it be “Plata o Plomo”? There is money and power to be made. From now on, nowhere is safe”. “Narcos is about a lot more than violence, money and power,” says FTX Games head of business development Aaron Berndtson. “We really wanted to explore the moral ambiguity from the show, where right and wrong are subjective. We’re very excited to put these choices into the player’s hands”. Narcos: Cartel Wars is set to hit the App Store this September to coincide with the release of Narcos season 2 on Netflix. The game will be free to download with the option of in-app purchases, and will be available on both iOS and Android. Season 2 of Narcos premieres on Netflix this September 2nd.